I don’t mean sudden and important updates. There was about four minutes of news between each break. There are eight breaks like this each hour. No doubt, CNN provides a valuable service. But a compelling story like the disappearance of a modern jet airliner with 239 souls onboard certainly draws more eyeballs to those commercials which is something I’m sure neither the network or the advertisers mind. We’ve all known that ads pay for news; that advertising is more important than news. News purists like to think it’s the other way around, but it’s not. However, there is something skeezy about the concentration of ads throughout CNN’s broadcast day during this crisis. In April 2013, Slate Magazine produced a story called “Breaking News is Broken”. 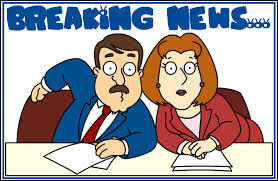 I’ll be posting more later about “Breaking News” . But I wanted to make sure that I mentioned something about the money first. Commercials are funny things. The trend throughout the 70s and 80s was 60 second commercials. Then it dropped to 30 seconds in the 90s. Then, for awhile in the 00s, marketers experimented with 20, 15, 10 and even 5 second commercials on the thinking that people didn’t have the patience to watch long commercials anymore and that a quick, focused ad would stick in the mind better. It’s the same thinking that eliminated the black between commercials. Remember that? Commercials used to fade completely to black and the sound used to go completely silent. Then, after a second, the new commercial would start. But stations started editing the end of one to the beginning of another because network bean counters realized that over the course of an evening, they might be losing as much as several minutes of potential revenue to black which could add up to hundreds of thousands of lost dollars a day. Kinda sorta the same thing with program intros. I think of old school intros like Gunsmoke, or the Rockford Files or Gilligan’s Island. Maybe, more recently, Law and Order, as intros that were at least a minute. But Hawaii Five-O has an intro version that is less than 15 seconds long. CSI’s isn’t much longer. Again, the longer the intro, the shorter the time for commercials. But this new Oreo commercial is delightful in that it is a luxurious minute and a half long. That is crazy! That makes it longer than the intros to Psych, NCIS or the Big Bang Theory. And it’s full of animation that reminds me of Prince from his Paisley Park days, but with robots and monsters and vampires. It’s totally fun. Could Oreo be onto something? Do they think that our culture has suffered enough blazingly short commercials and that now it’s time to swing the pendulum back? I mean, who cares if the local attorney or used car sales man has a 180 second ad on at 3:17 a.m. But, Oreo? That’s Nabisco, and Nabisco doesn’t screw around with its revenue. The Oreo cookie was the best selling cooking in the US in the 20th century, and is still the best selling cooking well into the 13th year of the 21st century. Let’s see what everybody else does. Expect down-and-dirty-in-a-minute-thirty copycats. UPDATE: Many of the drug companies are now using 1:00 to 2:00 commercials to promote their drugs and discuss the potential hazards of them. According to ispot.tv, they include 1:00 commercials by the makers of Lyrica and Embrel. The maker of Eliquis is running some 1:15 spots and a spot for the drug Xarelto is 2:00 minutes long. These represent hundreds of thousands of dollars for drug companies, for example. It is no wonder time and space for commercials has become a hot commodity. Wasting a second of time is not in a network’s interest.